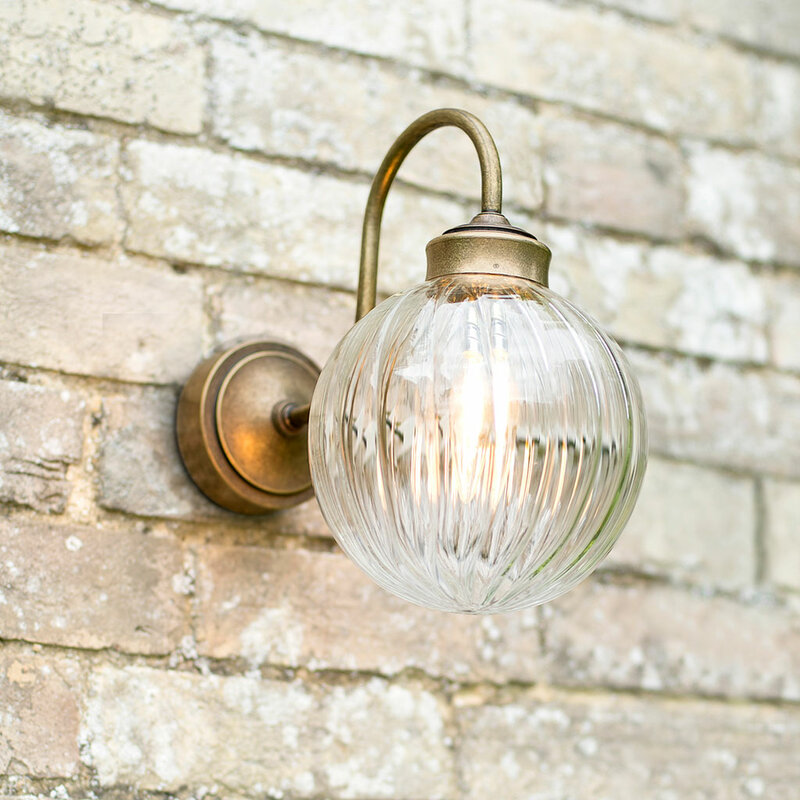 Our new Putney wall light in our beautifully reflective glass and metal is IP rated for bathroom or outdoor use, so ideal for adding a designer touch to your bathroom or porch. 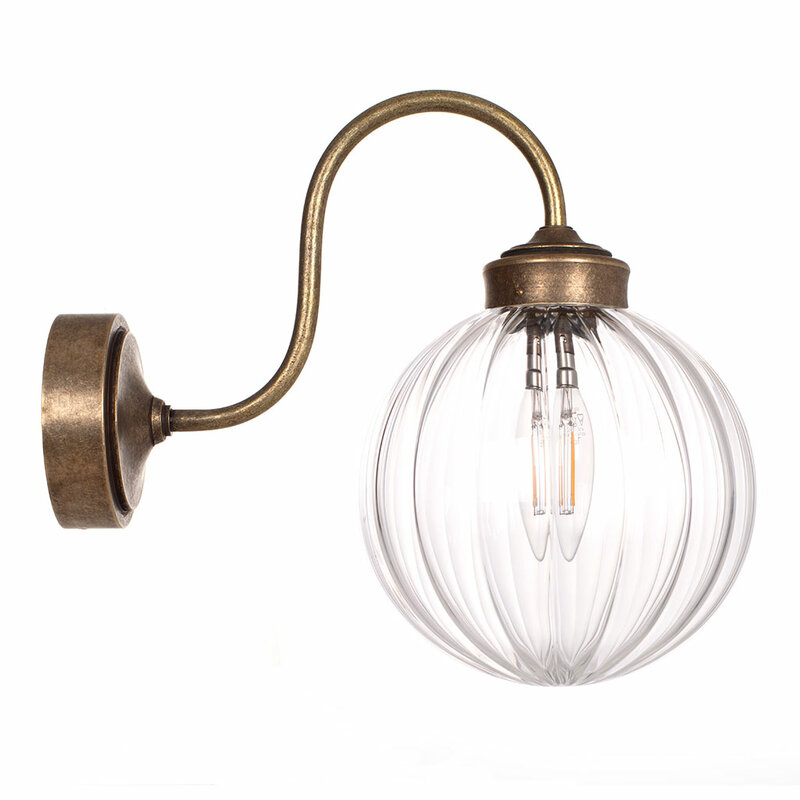 With its on-trend, hand blown fluted glass shade showing the beauty of a vintage style bulb inside, the Putney is a contemporary classic that will suit a modern bathroom as much as a period one. The Putney may look familiar as he is the little brother to our Fulbourn pendant light, which we have tweaked to create a smaller version for your walls. Each light features an elegant, curved swan neck arm that has been individually crafted from natural brass, and a hand blown glass shade. 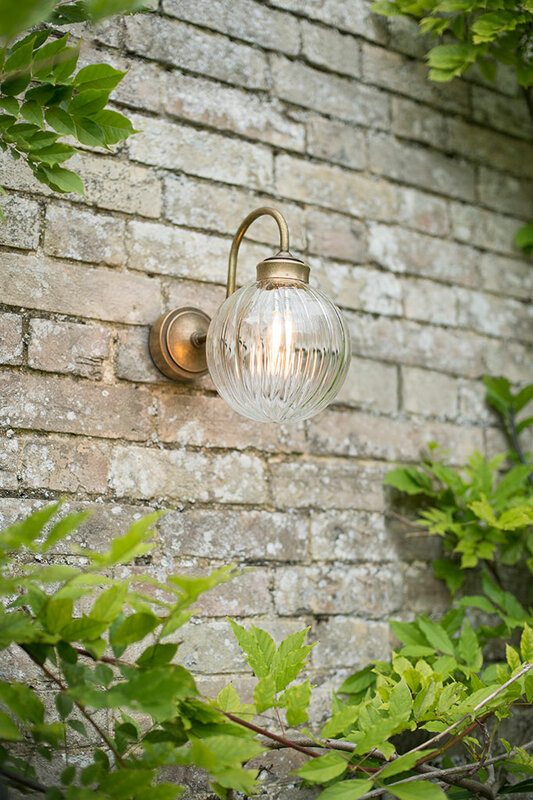 All Jim Lawrence lights are made using traditional metal working techniques and are hand finished to the very highest standards here at our Suffolk workshop. 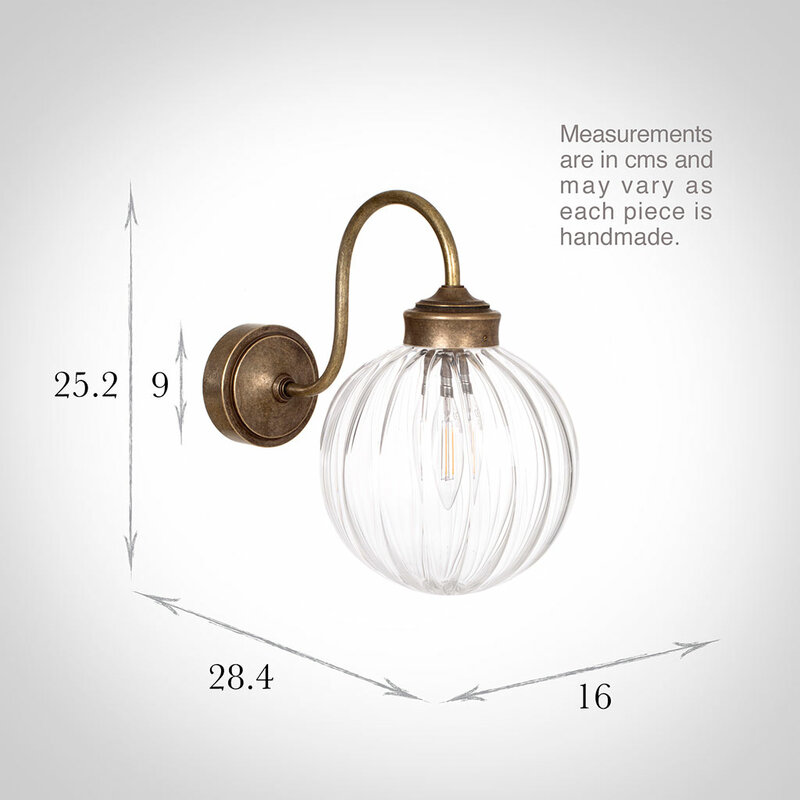 IP rated 44 for bathroom zones 2 & 3 and fitted with one of our heritage-look, dimmable LED bulbs, the Putney will work hard as a tasking light, which is just what you need for a bathroom or porch. To change the bulb, simply unscrew the shade. IP Rated: IP44, compatible with motion sensor (not supplied). For more information about the meaning of IP ratings, please read our ‘Guide to Safe Bathroom Lighting’. Antique Brass: A beautiful, natural finish that is created by treating solid brass with antiquing solution to speed up the natural tarnishing process to create a lovely aged look that will darken naturally over time. To lighten the brass, just buff it occasionally with a small amount of brass cleaner to return it to its original hue. Renowned for its non-corrosive properties we use solid brass in this design as it has fantastic durability that will stand the test of time in any garden. To find out more about our finishes and how best to maintain them, please read our product finish pages. 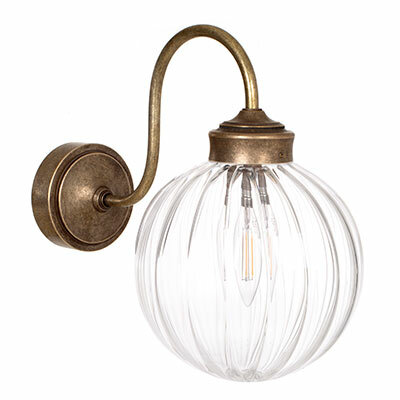 Antique Brass will catch the light more than our painted finishes so is great to use if you want to make a statement, as it will help draw your eye to it. Being IP rated, our Putneys are incredibly versatile and can be used as a tasking light anywhere in your home where there’s high levels of water vapour such as your kitchen or laundry room. We have a range of Putney lights to choose from including an equally charming bathroom pendant light. 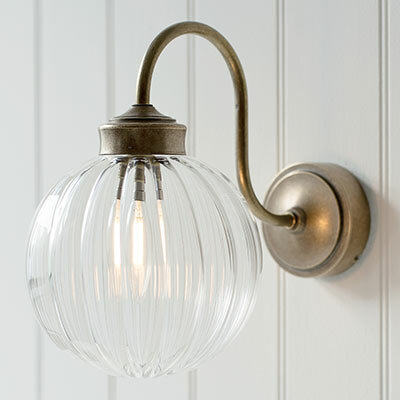 The Putney will go particularly well with our brass Bletchley Bathroom Range. For a stylish, uniform look to your home, try matching your Putney with other antiqued brass lights and accessories such as our range of window latches and door handles, or collection of brass switches and sockets. This is beautiful, the glass is so well made and once it was installed by the electrician, it sits proudly in our bathroom. This is my second purchase, it looks stunning outside our home, very well made and the design is so simple. I wanted a lamp that would fit with our old house and i am so happy it works so well, plus it was easy to install.